We dedicate this page to all collectors, dealers and enthusiasts who are passionate about antique ceramics. This is the place where everyone can share their experience, knowledge and opinion. We will regularly post some mystery pieces from our stock which have unknown/problematic origin and give the opportunity to our visitors to discuss, leave comments, post photos and any information related to the object. A Pair of Continental Porcelain Candlesticks, 18th century, each decorated with six cartouches, painted with mythological figures* in shades of gray and blue on deep brown ground and gilt. Dimensions: 26 cm high. Minor damage. Marks: Letters "L." and "B. ", incised on the base. 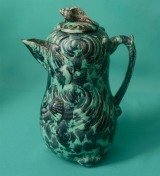 A Very Rare 18th Century Creamware pottery Coffee Pot and Cover (Possibly Continental), with moulded seashell decoration, standing on three shell-shaped legs, painted in Whieldon style in shades of brown and green. Dimensions: 22 cm high. Condition: a chip on the spout and inside the cover. Unmarked. An 18th Century Porcelain Dessert Set (Possibly Doccia) c.1780-90, comprising 10 plates, hand-painted with roses/flowers in polychrome enamels. Dimensions: 22 cm. diam. Some plates marked with a scratched cross. Condition: manufacturing faults, some plates with hairlines, one with a chip on the foot rim. (This set has been shown to specialists from Bonhams, Christie's, "Antiques Road Show", dealers and collectors. Several attributions were suggested: Early 19th C French, 18th C Bristol, 19th C Staffordshire and Doccia). 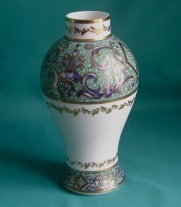 A rare early 19th Century Porcelain Vase of baluster shape, superbly painted with enamels and gilt. Dimensions: 16.5 cm. high. Excellent condition, lid missing. Mock Chinese mark on the base. * Christie's described this piece as 18th Century Chinese, two of the experts on "Antiques Road Show" said it is Early 19th Century English (possibly Spode).